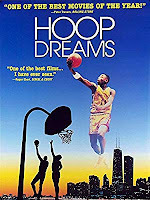 This much-celebrated documentary from 1994 follows the life of William Gates and Arthur Agee, two young Chicago basketball players who share the familiar dream of college scholarships and eventual NBA stardom. Pruned from 250 hours of footage, the riveting 3-hour film spans five years in the lives of these young black men, starting as they prepare to enter St. Joseph's, the predominantly white Catholic high school that helped shape NBA legend Isiah Thomas. Examining the pressures and the incredibly long odds facing even créme-de-la-créme athletes, director Steve James artfully balances the triumphs and suspense with pathos -- including Arthur Agee's return to a high school in the inner city. Although there's more than enough exciting basketball footage, James and his cowriter Frederick Marx, capture their most dramatic moments in Gates and Agee's off-the-court experiences. 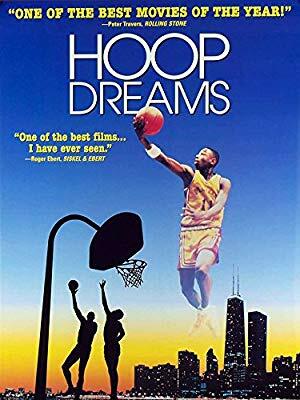 For anyone lured by the extraordinary highs of the sporting life, Hoop Dreams emphasizes that the lows can be just as significant. It's easy to see why this remarkable film provoked a huge outcry when it failed to receive an Academy Award nomination in the Documentary category: No other film has ever explored this triumphant and heart aching court of dreams.